Conflict is something we think of through the allowances and permissions of theatrical situations and the language of war and ideology. In Ballad of the Burning Star, it is its intimacy that earns a particularly poetic examination. Developed over a period of two years, first premiering at the Edinburgh Fringe in 2013 and opening in London at Battersea Arts Centre this spring, Ballad of the Burning Star navigates highly disputed political territory with the skilful use of theatrical metaphor. It investigates intimate questions around belonging and conflict, roots and politics by positing theatrical problems. Ballad is inspired by Israeli-born Nir Paldi’s experience, as teenager and young adult, of growing up in the midst of the Israeli-Palestine conflict. 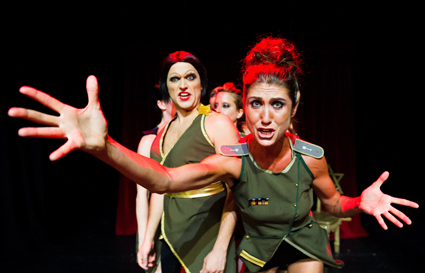 Focusing on a particular moment of gun-point conflict that is twisted through a series of dramaturgical operations, the show draws on cabaret and drag, flirts with irony and humour, constructs a play within a play, develops deliberately manipulative stage politics and positions the audience in a landscape that moves from narrative to rhetoric. Paldi plays Star, the host for the evening, a drag queen clad in gold who, assisted by The Starlets, an all female group of dancers dressed in tightly fitted military uniforms, and Camp David, their musician, tells a story about a boy in the midst of conflict, moving from the kibbutz to school bus, desert to town, sibling rivalries to bomb explosions. Within the series of narrative and occasionally musical vignettes, Star intervenes with commentaries about the Starlets’ performances and various forms of deceptive audience participation. Ballad begins with Star announcing a bomb in the theatre; we’re now to find the terrorist, seeking among the rows of raked seating the most dubious, most recognisable culprit. The awkward, pressing silence of the audience as Star makes her way up into the seating and her aggressive playfulness present an apt context for a performance that seeks to both isolate and conflate the personal and the national in conflicts that are very much grounded in land and history, beyond the usual remit of political work. Rich in affect and daring in form, Ballad prefers to expose and argue, to think through constantly re-contextualised action. The aesthetic and stylistic elements hold particular power here, beyond a mere theatrical symbolism. The stage is bare, framed only by a pair of red velvet curtains; a star of David hangs like a mirror ball in the centre. The rich gold and red velvet, the language of oppression and oppressed, the nuanced, regimented movement are in stark contrast with the playful theatricality of Star and the brutal irony of the musical numbers. Drag brings a deliberate ambiguity and distance to the situation unfolding in the vignettes, performed with a sense of deliberately historicised theatricality. At the same time, the stage itself becomes a site of ambiguous power dynamics. The Starlets are caricatures and characters, the performance making constant reference to the actual background of the dancers. Increasingly abused by Star, they respond with an embodied resistance, emphasising an autocratic regime made visible beyond language. Here, the body is central—it becomes synonymous with the territories described in the narratives themselves. It is possible to problematise the identity politics seen in Star’s own drag, the ways in which questions of ambiguity and gender remain underexplored, yet recalled in the piece. At the same time, the complexity and nuance of the problem as presented through the performance—one pertaining to generations and individuals, to history and rhetoric, to land and topography—is made visible with precision. Ballad of the Burning Star is a performance of political in-betweens; those of form, of identification and autobiography, of conflict and theme. It’s a piece that presents a discussion of the intricacies of the Israeli-Palestine conflict, speaking with clarity and precision of identity, belonging, personal politics and theatrical metaphors, while maintaining a disarming formal and rhetorical ambiguity.